Sheltie Nation is Cool Site of the Day! If you like Sheltie Nation go vote for us now in the voting frame at Cool Site of the Day! Just follow this link below to vote, but be sure to do it today! Shane is off to college now. Callie is looking quite regal on her birthday. And you chase your tail around. Abby & Ellie are too funny Holly! Sheltie Nation member Cindy H. nominated us for the Blogger’s Choice Awards. What an honor! 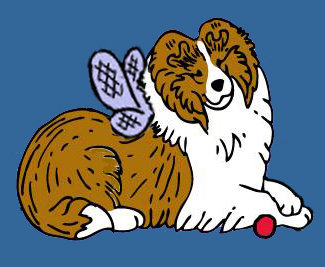 Be sure to follow this link & vote for Sheltie Nation as your favorite animal blogger. This is your chance to show the rest of the internet world just how wonderful Shelties are! Ever wonder or wish you could do something useful with all that hair you get from your Sheltie at grooming time? In the spring, I’ve been known to stuff a few clumps of it into a suit feeder & put it out for the birds. They love to incorporate it into their nests. In case you missed it, there are businesses out there that will take your dog’s hair, spin it into yarn and/or make items of clothing for you. This cloth is often referred to as “Chiengora” (pronounced she-an-gora). Would you believe spinning dog hair into yarn is not a new art? Traces of dog hair have been found in yarns of pre-historic Scandinavia and among the North American Navajo Indians. So why do so few people know that you can make dog hair into yarn? Probably because making yarn from dog hair must be done by hand and it’s just too problematic to spin it by machine. As more people are rediscovering the fun of hand spinning, making dog hair into yarn is again becoming popular. The most striking featured of chiengora is its unique fur-like appearance. This furry look, so reminiscent of angora, just seems to invite touching. Wearing anything made from chiengora in public invites comments, questions and even an occasional pat on the back – to see if it is really as soft as it looks. The softness makes spun dog hair a real pleasure to wear. A great advantage of chiengora is that it fluffs as it’s worn. It does not pill. This fluffing maintains the new appearance of anything made from dog hair. Properly spun, chiengora sheds very little. It can be dyed with any commercial dye following the directions for delicate fiber. For warmth it’s hard to beat chiengora. Putting on a pair of mittens woven from it is a real treat. And they actually feel warmer as the temperature drops. Because of this quality, dog hair is more comfortably worn in cool to cold temperatures. Because chiengora is also somewhat water-repellent, it insulates well in cold damp weather. Interested in making a keepsake of your favorite Sheltie? Fur-Ever Creations is one such business that does this. Another company called “VIP Fibers“, does the same thing. Or, you can do a search for “chiengora” on the web. …or we would all be in a lot of trouble. :) Shane and Blair are ready to help out. Turbo tax operators are standing by to help you with your questions.